I should thank the recent uptick in pregnancies in my congregation for discovering the new ESV Pocket New Testament with Psalms and Proverbs by Crossway. If it wasn’t for the inordinate number of “Baby Bibles” that I have been buying and giving away lately, I might not have ever discovered this little gem. The background to this story is that our church always gives away a small New Testament to each couple that gives birth to a child as a way of saying thank you for growing the church the “old fashioned way.” Since our church is now filled with expecting mothers (there must be something in the water) I have purchased quite of bit of them lately. I am not sure how many of our babies come out of the womb ready to read the 6-7 point font on most tiny Baby Bibles, but it’s a nice token by which to remember the occasion anyways. Well, as fate would have it, the normal KJV Baby Bible with the adorable pink and blue covers were not available. So by necessity, I went another direction – Crossway’s “Coffee” TruTone. (Symbolic of the extra caffeine young parents need, I guess). Please don’t think this Bible is only for babies. It’s not. Actually, it may have a very mature function for the rest of us. 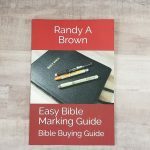 Its tiny stature (just over five inches lengthwise) may fit into the hands of the smallest children among us, but this could make a great witnessing tool or give-away Bible for your church. One of the ways that this Bible blows away the competitors is that it actually features line matching. I have no idea how the technical wizards over at Crossway got this to synch up so nicely on the paper, but they did it. That makes the smaller type extremely legible. The paper itself is rather nice. Honestly, I think it might even be a bit thicker than my Pitt Minion’s paper which I love and treasure. China versus Jongbloed? I know, it’s no match. But believe me, this is pretty good stuff. I don’t think anyone will struggle to read the modern font, except those with really bad eyes (you know who you are). The rest of us can just pick up our “cheaters” and read it just fine. Or if you are a near-sighted Bible nerd like me, with your naked eye. The print is crisp, dark, and consistent throughout. The red letters in the words of Christ are well done, although they look a bit violet to me. This Bible looks and feels great. Does it fit into your pocket as the title suggests? Yes. It has no problem sneaking down into both the back pocket of my jeans and the inside pocket of a sports jacket or suit coat. Truth in advertising! How do you like that? The Coffee TruTone is really nice. Here’s my take on TruTone covers: If you know what you are buying, they are a great value. Some of them are so visually convincing that many people might not even be aware they are buying something cooked up in a lab and not shorn from an animal’s hide. This one looks pretty convincing. I think Crossway should do more with the Coffee look. If I am going to go with a TruTone (no shame in that by the way) I at least want something that looks noble and respectable. I’m not a fan of the brighter or fancier designed TruTones that Crossway sometimes uses. 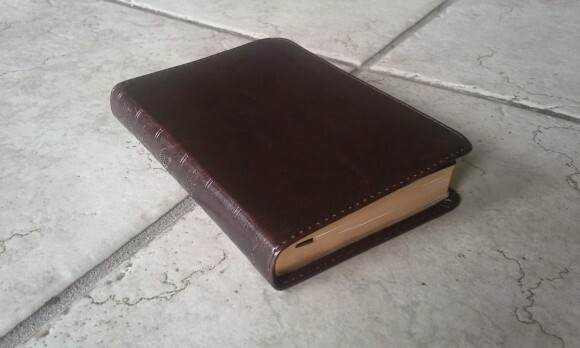 They even threw on some perimeter stitching to give this little Bible a gentlemanly look. The only thing that Crossway and TruTone hasn’t perfected yet is the smell. No leather smell here. Just good old polymer science at its best. A couple of minor critiques can be made. The first has to do with the paste-down binding. This one uses mere cardstock to adhere to the cover. I don’t think that’s a good idea. Leatherette will be much more resistant to damage or moisture than this. With the on-the-go abuse this little dynamo may absorb, I could foresee that becoming a “big problem in little China.” Tag on an extra 70 cents to the cost; I think it’s worth it to upgrade that paper liner. This ESV Pocket NT is even Smyth-sewn! I’m not sure that’s ever been attempted before on a Bible this small, but I suppose someone, somewhere has done it. The good news is that the book block will last. The bad news is that it doesn’t come anywhere near being able to stay opened flat by itself. Mine has sort of a “venus flytrap” affect. Keep fingers away – they may get bitten clean off! Maybe it will loosen up after being worked over for a few months. Pitt Minion is still the undefeated champion in this category. Here’s the bottom line: whenever we grade a Bible we should evaluate it according to what it bills itself to be. This one does what it was designed to do with excellence: stand by with alacrity as your glove-compartment or backpack Bible ready to share the Gospel with a friend at school or coworker on the job. For a mere $15, you can have a great, readable edition of the Word of God standing at the post like an obedient sentry ready for service. Thanks so much for a good review of an interesting product. This gift to a newborn from the church certainly sets a good tone for the whole family. I have always been intrigued by small simple bibles. I have owned and given to my son a copy of the Authorised, text only in a beautiful calfskin binding from Thomas Nelson vintage 1970. 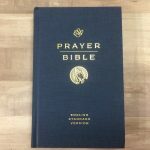 Recently, I purchased a Reduced Pitt Minion sold by Trinitarian Bible Society, printed for them by Cambridge, with cross references and reading plan, its dimensions are: 5 5/8″X4″X7/8″. 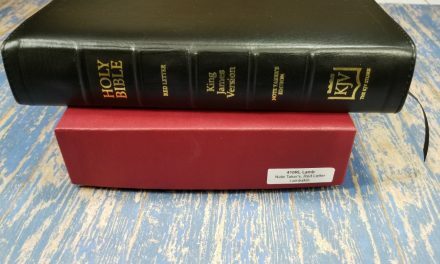 This last mentioned bible gets a surprising amount of use, especially since I saw the need of a magnifying sheet that can be tucked into the bible It is available in premium calfskin with twin ribbons. I believe anything with less than an 8 point font should come with a magnifying sheet from the publisher. I can tuck this bible (complete bible) in a shirt pocket, and when I find myself in a waiting room, or other location with time on my hands I can read God’s Word, it fits almost exactly into a normal shirt pocket. 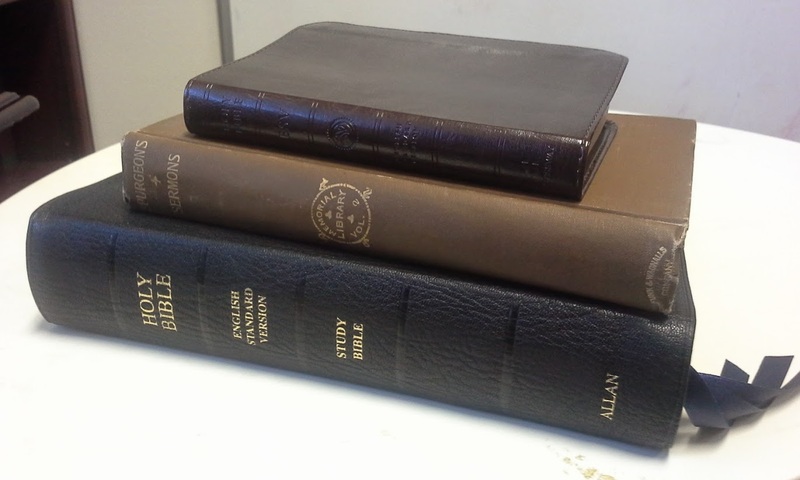 This bible is almost the same size as the New Testament you have reviewed. 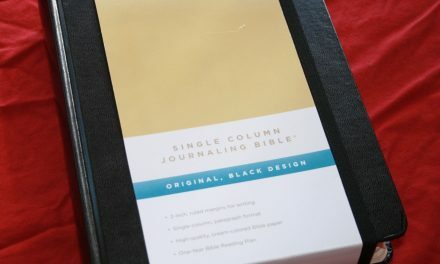 With the magnifying sheet the 5.5 type font is quite readable in any reasonable light, and makes this handy little bible a go anywhere bible. 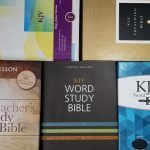 While the New Testament is good and handy to have, the little reference bible allows me to check citations in the New Testament against the Old Testament sources. As I said, the possibilities of having a truly portable copy of God’s Word are intriguing. More attention should be paid to portability in my view, one can always go to the reference shelf when he gets home, but a small portable cross referenced bible is extremely useful. Just put it in the pocket, and you are good to go. For babies, this ESV NT is also available in pink or blue TruTone, along with a white one for weddings. I have the black genuine leather version. The leather is much nicer than the usual stiff shiny “genuine” leather. I love the single column format and 7 pt. print. It’s the nicest NT edition I’ve ever seen. 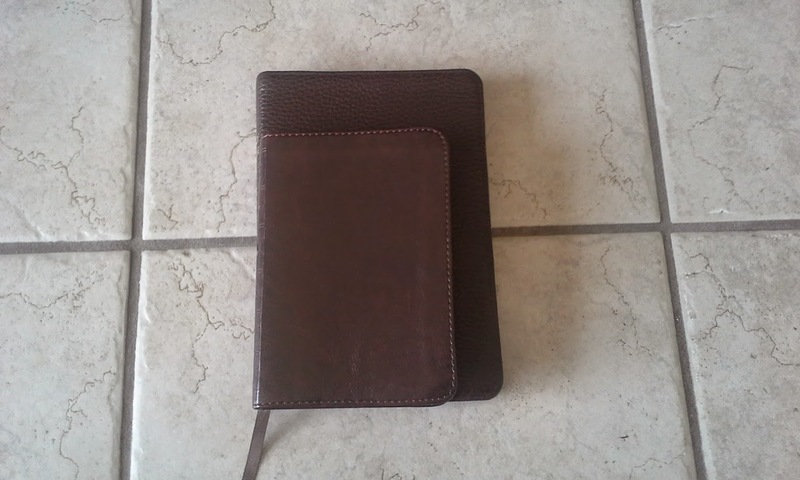 Currently, christianbook dot com has the leather edition on a spring sale for $14.99, an excellent price for it. I ordered another one today for a gift. They also have the other colors of the TruTones, but I don’t recall the prices of those. Thanks for your very helpful reviews. I enjoy reading them.